Ashford Farm is owned and run by Simon and Alexandra Bridger and their young family. It is situated some 2 miles west of Petersfield, Hampshire, on the outskirts of the village of Steep and below the beautiful Ashford Hangers. Here we farm around 1000 free range turkeys and 130 free range geese. They arrive at the farm as day olds in April (the geese) and June (the turkeys) and as soon as they “feather up” they have daily access to our fields, where you will find them perching on the perimeter fences or having dust baths in our wood-shaving pile! We also farm a small suckler herd of cows under the watchful eye of Jacaranda the pedigree Charolais Bull, rearing around 40 home bred calves a year. These are sold mainly as store cattle at around 18 months of age, although some we take through to provide fresh quality beef boxes at the farm gate. We also have a flock of sheep and a number of outdoor reared pigs, which enables us to sell our home-bred fresh lamb and pork boxes during the year, as well as our gammons, sausages and bacon at Christmas time. In addition we have a handful of free range laying hens, who can often be spotted scurrying around the hedgerows and who provide fresh eggs! 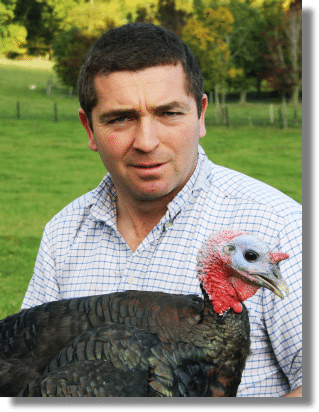 At Ashford Farm we are committed to providing our customers with fresh, quality local meat by providing our animals with a high standard of husbandry and a happy life. We hope this is reflected in our finished produce.